In 1878 one James Ritty (see biography of James Ritty), a 42 years old saloon keeper from Dayton, Ohio, was brooded so much over the peculations in his business, that he suffered a breakdown and decided to take a steamboat vacation trip to Europe. His business seemingly flourished, but he lost money, and he knew the reason—like every other retail business of the day that handled money over the counter, the only receptacle for receipts, save the pocket of the owner, was a cash drawer. It could be easily opened with the result that barmen were able to hold out as much cash as they desired. A constant turnover of barmen brought James Ritty no relief. Having been trained as a mechanic, during the trip Ritty became interested in the machinery of the ship and made friends with the Chief Engineer. Soon he had the opportunity to examine the engine room, where he saw pistons and governors and drive shafts and steam gauges, but something else caught his eye—he became fascinated before the automatic mechanism, that recorded the revolutions of the ship's propeller. Ritty thought: If a device could be made to count the revolutions, why not one to count transactions? There is a great field for a machine that can do this work. From that inspired moment, amid the din and clash of the engine room, the idea of the cash register began to take shape in his mind. Ritty became so obsessed with his idea that he cut short his stay in Europe and returned to USA. Back in Dayton, James immediately tossed the question to his twin-brother—John. Two of James' brothers (there were five brothers), Sebastian (1827-1891) and John (1836-1913), also were of an inventive turn of mind. The eldest brother, Sebastian, took out a number of patents on farm implements. John, who was a mechanic by trade, carried on the inventive tradition of the family. Among other things (like a wheel, railroad car coupling, etc. ), he patented several machines for the hulling of green corn and set up a canning factory in which they were used. Ritty brothers started their work in a small room on the second floor over the James' cafe at 10 South Main Street, Dayton. In the middle of 1879 they already had a working model, but it was a total failure, being inaccurate. 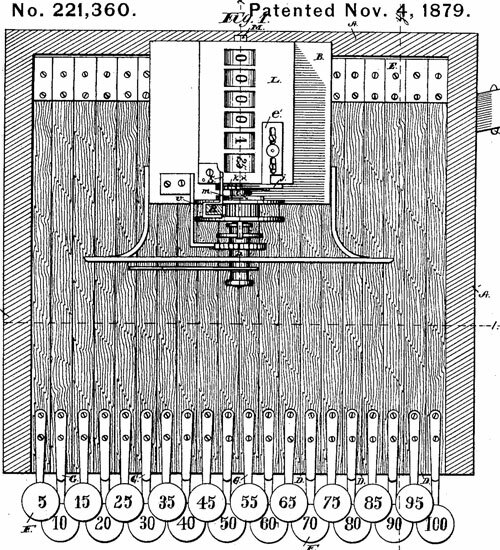 The cash register of Ritty was essentially a keyboard adder, and these type of machines were known in the USA and the world from decades, see for example the machine of Caroline Winter from 1859. 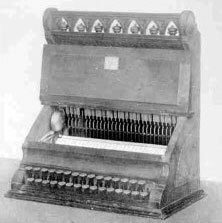 Like the machine of Winter, the first model of Ritty cash register (see the nearby image) looked like a clock with a keyboard. It had two rows of keys along the lower front, labeled with cents in five cent increments from 5 to 95 cents and dollar amounts from 1 to $9, and had no cash drawer. Pressed down, each key represented the individual amount of money to be recorded. 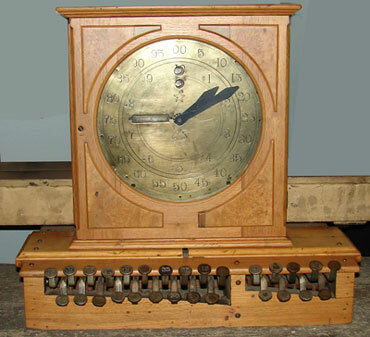 The sales were registered on large dial, probably resembling the one on the ship, with two sets of numbers (the outer circle of numbers showed cents and the inner one dollars) around its circumference and two hands operated by the keys. The second model wasn't all that better. It resembled the first in all details with one exception—instead of adding disks the brothers designed a series of adding wheels mounted in the back of the machine. The above-mentioned second model was patented on 4 November, 1879 (see the lower patent drawing of US221360) as Cash Register and Indicator. It was the first US patent ever issued for a cash register. However, neither of these two models was put on the market. Obviously dissatisfied with their first models, the brothers began a new line of development. In the third machine, called Ritty's Incorruptible Cashier, instead of the dial type of indication they substituted a tablet form with pop-up numbers. The tablet indicators were small plates bearing the same money values engraved on the top of the keys, and were connected with the indicators by vertical sliding rods. As a key was depressed the indicator rod, resting on the key, was elevated until the indicator showed through a glass-covered opening in the upper part of the machine. This seemed to be an important improvement because the amount of the sale was revealed to both cashier and client, thus providing increased protection for the merchant, because it shed the light of publicity on every transaction. There was still no cash drawer in the machine, and this model was also not sold to the public. In their fourth machine, which came to be known as the paper roll machine (see the nearby image), Ritty mounted a paper roll horizontally above and across the keys inside the box. Each key carried a sharp pin, and when the key was depressed, its pin pricked a hole in the paper roll just above the key. At the same time the paper roll would be advanced one step. The result was that at the end of the day the owner could remove the roll of paper, tear the portion representing the daily sales, and count the holes in each column. If for example there were 100 holes in the 25-cent column at the end of the day, the merchant knew he had done $25 worth of business in 25 cent sales. Thus the register not only told the owner the exact amount of the day's business, but also the total done in each price range. There was a bell to "ring up" sales. The paper roll machine was the first to be put on sale, and several sales had been made to bar and cafe owners. 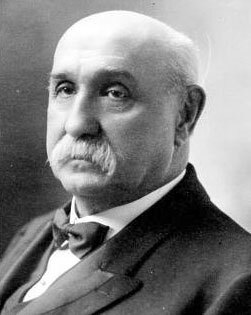 Soon John Henry Patterson (1844–1922), an eccentric and aggressive businessman from Dayton, who was mainly in coal and railroad affairs, but also had a grocery and general store, bought a couple of the machines for his store. Before very long Patterson was to become the pioneer of cash register production and to make his name synonymous with its development and distribution. We were obliged to be away from the store most of the time so we employed a superintendent. At the end of three years, although we had sold annually about $50,000 worth of goods on which there was a large margin, we found ourselves worse off than nothing. We were in debt, and we could not account for it, because we lost nothing by bad debt and no goods had been stolen. But one day I found several bread tickets lying around loose, and discovered that our oldest clerk was favoring his friends by selling below the regular prices. Another day I noticed a certain credit customer buying groceries. At night, on looking over the blotter, I found that the clerk had forgotten to make any entry of it. This set me to thinking that the goods might often go out of the store in this way—without our ever getting a cent for them. One day we received a circular from someone in Dayton Ohio, advertising a machine which recorded money and sales in retail stores. The price was $ 100. We telegraphed for two of them, and when we saw them we were astonished at the cost. They were made mostly of wood, had no cash drawer, and were very crude (Ritty's Incorruptible Cashier). But we put them in the store, and, in spite of their deficiencies, at the end of twelve months we cleared $6,000. 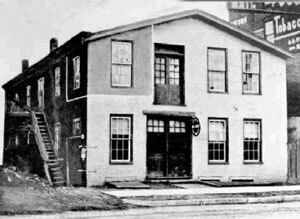 In 1880 the Rittys established a small factory in Dayton to manufacture their cash registers (see the nearby photo). John Ritty was foreman, and factory staff numbered ten men. Since the first machines, that were launched to the market were largely constructed of wood, most of the employees were carpenters and cabinet makers, a trade which James Ritty had followed in the past (James Ritty had been a carpenter and a shingle maker before he opened his first saloon about 1868.). James Ritty launched the cash register business under the name of "James Ritty's New Cash Register and Indicator", but his company did not prosper. In the end of 1881, he became so overwhelmed with the responsibilities of running two businesses (he still conducted the cafe which demanded the major part of his time), that he and his brother decided to sold all his interests in the cash register business, including patents (in 1883, James Ritty, together with John Birch received another patent for cash register—US271363), for only $1000. The buyer was Jacob Eckert of Cincinnati, a glass and silverware salesman. A new company was established to manufacture and sell the first mechanical cash register—National Manufacturing Company of Dayton, Ohio. Eckert soon realized that one man couldn't do the job, from the standpoint of either time or money and organized a stock company, capitalized at $10000 and sold something less than half the shares to four other men (between them John Patterson and his brother Frank), keeping controlling interest. John Patterson became majority owner in 1884, and the company was renamed National Cash Register Company. Despite of the fact, that did not derive much benefit from his invention, James Ritty was not resentful and maintained most friendly relations with John Patterson and his brother Frank, who many times invited Ritty to attend various NCR meetings and conferences and admitted his pioneering role. Patterson formed National Cash Register Company (NCR) into one of the first modern US companies, introducing new, aggressive sales methods and business techniques (although in 1912, the company was found guilty of violating the Sherman Antitrust Act. and Patterson, Thomas J. Watson (the future president of IBM), and 26 other NCR managers were convicted for illegal anti-competitive sales practices and were sentenced to one year of imprisonment.). Patterson established the first sales training school in 1893, and introduced a comprehensive social welfare program for his factory workers. NCR had a glorious history and survived up to our time.